Tiny Houses – The Tiny House Movement, a social movement where people are downsizing the space that they live in, is really taking hold. The person credited with starting this movement, Sarah Susanka, is an English-born American-based architect, and author of nine best-selling books who initiated the “Not So Big” philosophy of residential architecture, which aims to “build better, not bigger.” A tiny house can be anything from a log cabin on wheels, to a hobbit home tucked into a hillside, to a glass structure nestling in nature. One house often cited by supporters of the Tiny House Movement, is that of Noel Higgins in Ireland, UK. In less than two months, Noel masterfully constructed a 4.87m by 2.43m wooden house on wheels at a mere cost of €6,000. “Tiny houses are cheap to build, low maintenance and exempt from planning. It’s about downsizing generally and a move away from mass consumption. When you live in a small space it forces you to think what you need and don’t need,” said the proud home owner. 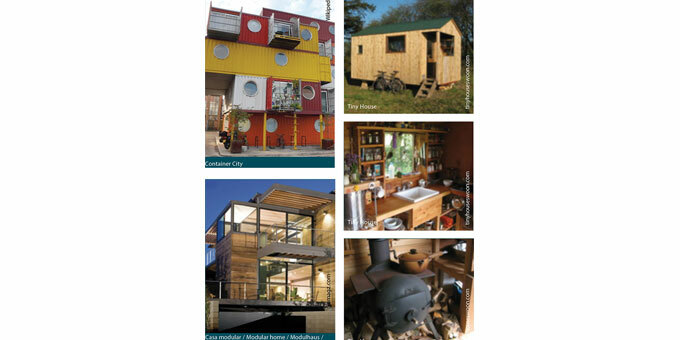 Shipping containers come in very handy for compact cost-effective living. Growing in popularity around the globe, one fine example, Container City, can be found at Trinity Buoy Wharf in East London. Here lives a burgeoning community of residents and office workers alike. One container measures in at 6.09m long and covers an area of around 45 m². And, their easily stackable form, means that adding additional levels is easy. Those not so drawn to DIY need not worry either, as there are companies across Europe, the UK, and the US, dedicated to converting containers to suit buyers’ chosen specifications, and add windows, door fittings and floors. Fibreboard homes – A recent graduate from Delft University of Technology (Holland), Pieter Stoutjesdijk, has come up with a stylish housing solution predominantly intended as emergency housing for disaster victims. However, with a fifteen year lifespan, it opens up many other short-term housing possibilities. The construction is made up of 2484 pieces of fibreboard, which require no external materials to fix, as they effortlessly slide together with a friction fit formula. Special coating is then applied to make the fibreboard more weatherproof. Designed for a tropical climate, it comes complete with a large overhanging roof for extra shade, a high ceiling for good ventilation, a porch, and a parabolic roof that can collect rainwater. This versatile structure can also heat said water. 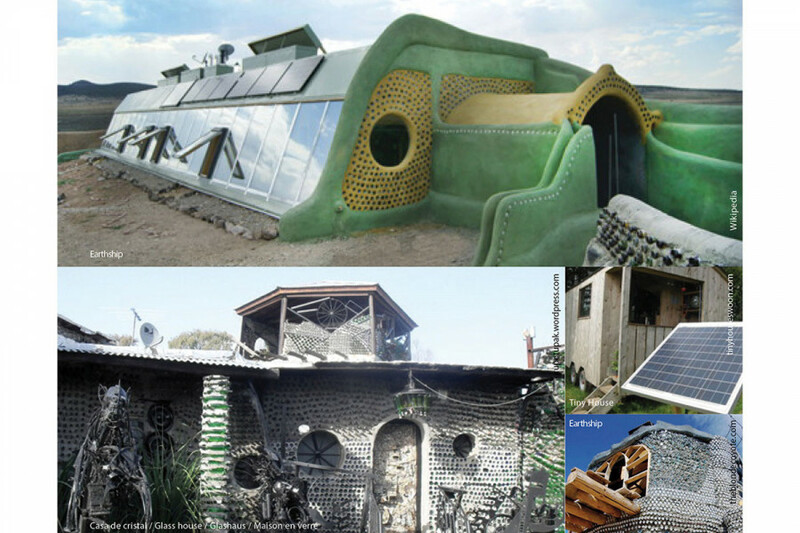 An Earthship is an eco-friendly form of housing that’s catching on. US-born Michael Reynolds designed the first Earthship back in the 70s, with a vision to reduce waste and energy consumption in our homes. An Earthship’s frame is normally constructed from reclaimed tyres, with additional features enlisting bottles, tin cans, and any other durable discards found in landfills. Many Earthship owners go the full hog, by creating indoor gardens for growing their own food. 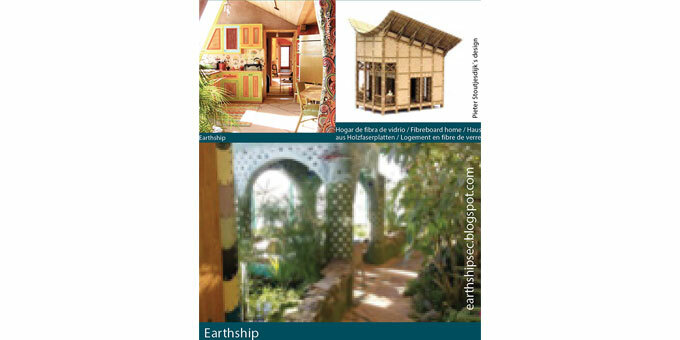 Today, in addition to single-family Earthships, there are also entire Earthship neighbourhoods and housing complexes. Wood pallet homes, courtesy of an American architectural firm, I-Beam Design, originally offered an affordable and eco-friendly solution for disaster relief housing. In fact, their first pallet homes were entered into a contest to solve housing problems for refugees in post-war Kosovo, but it soon became apparent that pallet wood can be used to create much more permanent homes too. As many have twigged, wood pallets are readily available, cheap and crying out to be recycled into very aesthetically pleasing homes.